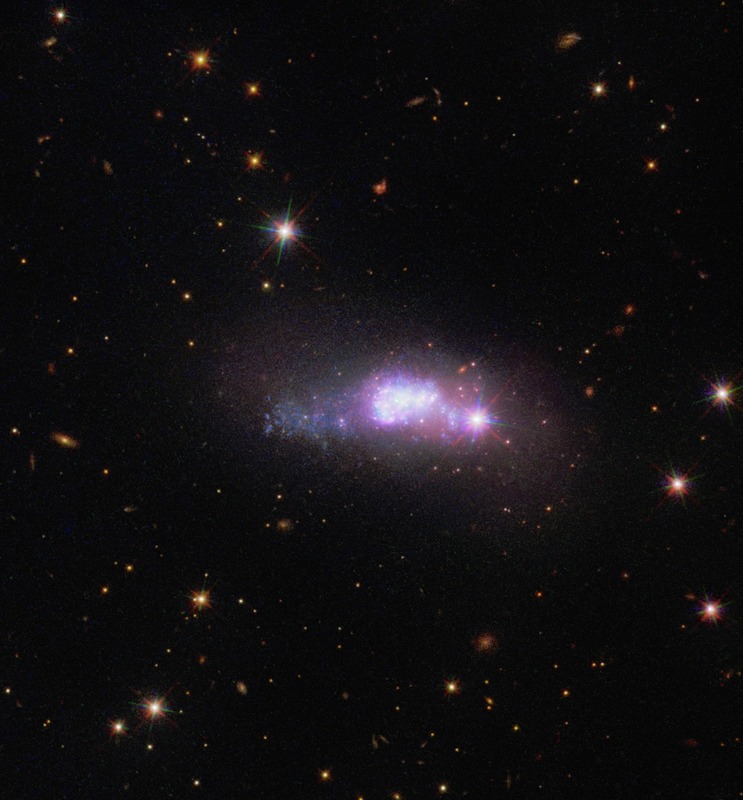 This captivating image from the NASA/ESA Hubble Space Telescopes Wide Field Camera 3 shows a lonely dwarf galaxy, a staggering 100 million light-years away from Earth. This image depicts the blue compact dwarf galaxy ESO 338-4, which can be found in the constellation of Corona Australis (the Southern Crown). Blue compact dwarf galaxies take their name from the intensely blue star-forming regions that are often found within their cores. One such region can be seen embedded in ESO 338-4, which is populated with bright young stars voraciously consuming hydrogen. These massive stars are doomed to a short existence, as despite their vast supplies of hydrogen fuel. The nuclear reactions in the cores of these stars will burn through these supplies in only millions of years a mere blink of an eye in astronomical terms. The young blue stars nestled within a cloud of dust and gas in the centre of this image are the result of a recent galaxy merger between a wandering galaxy and ESO 388-4. This galactic interaction disrupted the clouds of gas and dust surrounding ESO 338-4 and led to the rapid formation of a new population of stars.